Peter Barber and his wife Heidi have been touring all their lives and have fond memories of camping at the beach over the summer holidays for weeks on end, and it’s that love of touring that saw them bring up their own kids in the same way. From caravanning to campers and tents, they simply love touring Australia. It’s this love of Australia that ultimately led to the creation of the perfect touring accommodation for this couple. A comfortable and practical slide-on that met their needs. Their earlier Gecko Campers had been really popular but when that part of the business changed because of cheap imports, they looked to manufacture a better touring solution for themselves and their slide-on camper was born. What they didn’t realise initially was how many people they met on the road would want their slide-on and hence Gecko slide-on campers started to grow and expand. Peter is an ex-mechanic of 30 plus years and after getting out of that industry he ventured into boat building and became very adept at working with aluminium and steel. From designing to welding to finishing products for sale, Peter had a hand in every aspect of manufacturing. 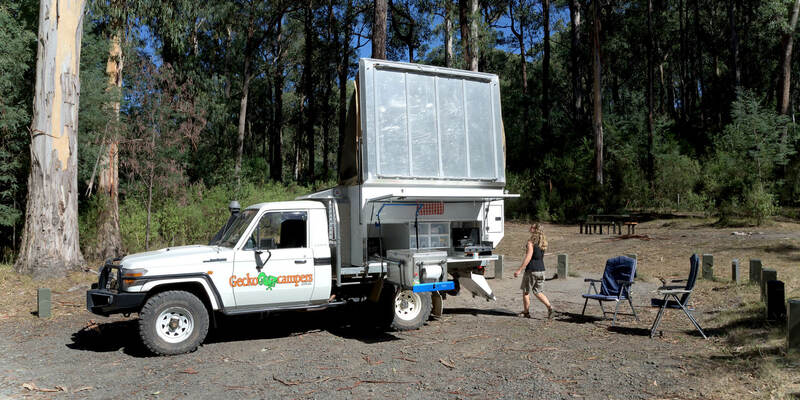 From boating which was hard yakka, Peter then went into manufacturing Aussie made camper trailers and developed his product to stand up to everything our country could throw at it. Peter is fiercely proud of being Australian and used Aussie products wherever possible to ensure he supported Australian manufacturing. The Gecko’s monocoque body has been fully engineered for durability and strength hence the 15 year structural warranty. The body is manufactured from 6062 & 5052 plate aluminium and offers strength and lightness for the purpose of touring in rugged country. The roof which lifts up on struts is tough enough to walk on and in fact Peter and Heidi talked about sitting up on the roof while watching sunsets. It can carry a small boat, kayaks or even wood, as tie down points are integrated into the roof. The body bolts to the tray of the vehicle and can be removed easily with four wind-up legs. The unit can be left free standing while set up on the legs so that the vehicle can be used for fun stuff! The doors and hatches all have compression seals to ensure a dust proof trip and are a big feature on the Gecko. On the back are two storage compartments. One on the driver’s side, a dry box, for canvas and other stuff, while on the passenger side is the compartment for the gas bottles and even a hose for the kitchen. Between these two compartments are the dropdown steps. 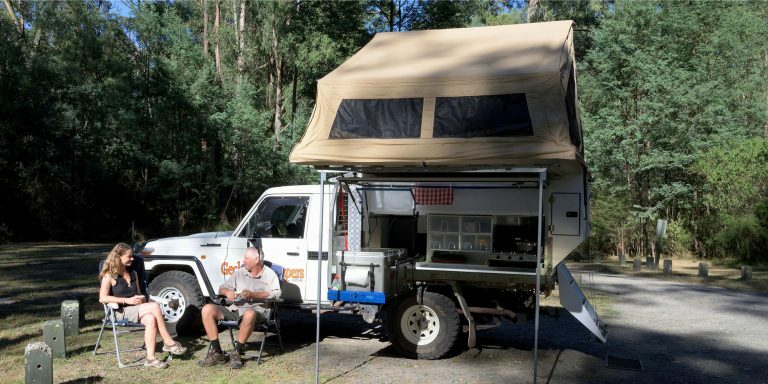 What I liked about this slide-on is that the ute can be driven or moved with the tent set up in basic form – that’s without the extra awnings and such. This came in very handy for the photoshoot, when we needed to move it for the best light. 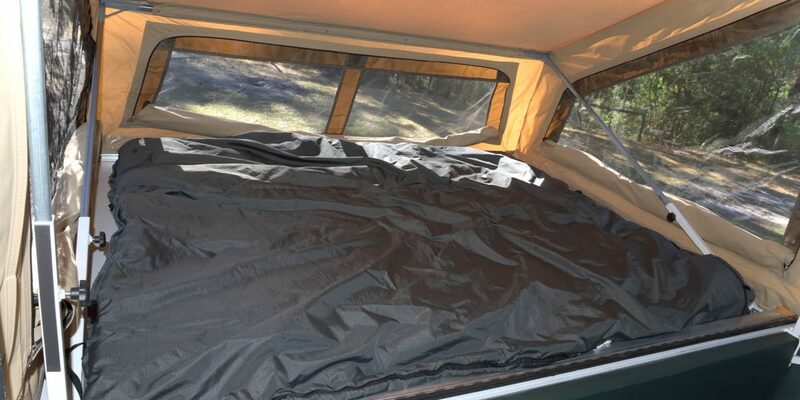 The canvas is manufactured from Wax Converters ‘Billabong’ Canvas, a high quality, light-medium weight, blended polyester/cotton canvas tent fabric. The tent section when the solid lid is lifted is erected easily from the inside with a push up pole system. On the passenger side a large door opens up to access the main storage space. This exposes the kitchen and fridge area and provides some protection from the weather if folks are just pulling up for a quick cuppa or a bite to eat on the run. On the driver’s side another door lifts up to expose the storage space. We’ll look at that in detail later in the yarn. 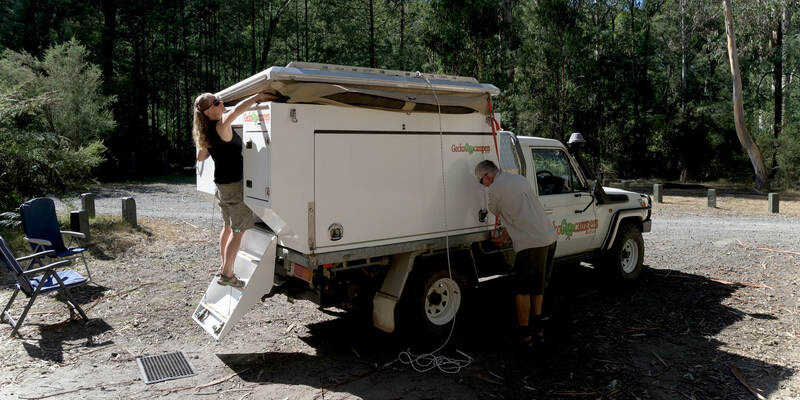 Peter manufactured a separate storage box that is mounted on the ute between the slide-on and the cabin. This is ideal for all manner of gear and means that if the camper is left behind there’s space for food and other gear in the box. With the lid lifted and the doors opened a gander on the inside is the go. The bed is a double bed mattress manufactured from high density foam. The mattress gets clipped into place so that it doesn’t flop down when the lid is closed or opened. There are lots of windows in the tent section for breeze and that’s a big plus. The main living area of the box will seat four people easily around an L-shaped lounge. The seat cushions lift up to expose the fridge at the front and also bits and pieces of the kitchen on the passenger side. On the driver’s side there is access to the back of the shower to house a toiletry bag and another hatch exposes the clothes storage locker that can also be accessed from the outside. There’s good shelf space in this main living area, which is handy. The kitchen is located on the passenger side and comes complete with the option 60 Engel fridge on a drop-down slide system. 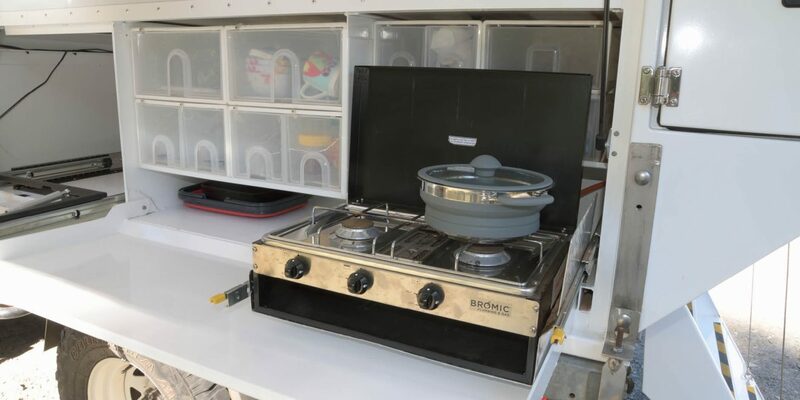 A slide-out two burner stove is there for cooking or boiling the kettle and all the other space available is taken up with storage boxes for food and camping equipment plus there is a storage shelf next to the cooker for bigger items. On the driver’s side is the drop down clothes locker as mentioned and a shelf underneath. One shelf can be used for flatter items and the one under that shelf is for boxes of gear. At the front of the storage area is a separate space and this houses the 75 litre water tank, a Duoetto auto 12V/240V hot water system and the electricals, including a Century 105amp hour AGM battery, CTEK Battery charger, and an auto solar input system for solar panel option. The shower is also mounted in this section and comes with an optional shower tent if required. Gecko offers a 3-year accessories warranty as a part of the commitment to a product that works. The Gecko slide-on looks really simple the way it’s been put together, however the engineering and work that has gone into making it user friendly and workable is what does it for me. Even the wiring box and switching panel is easy to reach and well-marked. Peter explained how the wiring is well laid out and easy to access that if an owner is having a problem they can check fuses and switches easily without having to crawl into a tricky space to find it. I liked the practical layout of this slide-on. It’s easy to use, has tons of storage space and includes plenty of living space inside if the weather is inclement. Knowing that Peter is building up the business and there have been a lot of changes since his camper was born, it might be time for him to update his own slide-on! The items I picked up on such as lids without struts, gaps and even some paint runs, are all addressed in the new models. So what I saw and what new buyers will see is very different – which is exciting! All I want as a 59yo male single traveller is a pod with a single bed or bunks , toilet, slide out kitchen, water, heating and cooling with plenty of power to run a c-pap machine, microwave and two fridges. Oh, storage as well. Does anyone make something as basic which is reliable and under $40,000? We have bought a Gecko slide on camper and we love it! Simple camping, easy set up and pack down, usable for overnight stops as well as more extended stays, it ticks all the boxes. 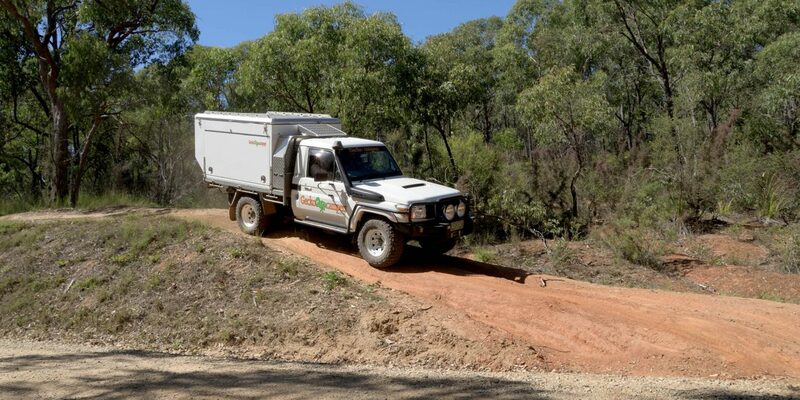 On our dual cab Landcruiser, it travels well and doesn’t seem to greatly affect economy. I have achieved about 14.5 L/100km and it did get up to 17 L/100km with the camper on and towing a horse float, so I was happy with that. I love the ease in which it can be removed for storage but haven’t done that yet when out camping. Peter has been fantastic answering questions and helping with little things that we wanted done. 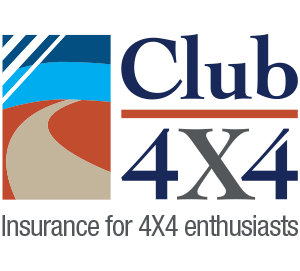 I can absolutely recommend the product and the people associated with it.